Our Ruby in Fuchsite is the best quality. It contains ample amounts of ruby spread throughout the fuchsite base. 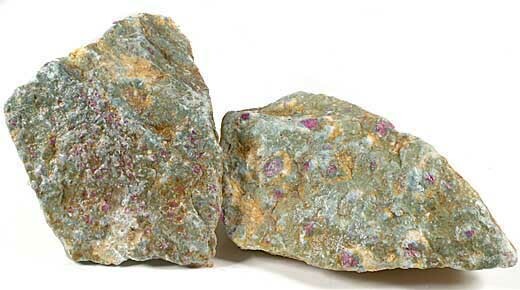 Ruby in Fuchsite is a popular stone because it has great color contrast. The green fuchsite is also known as chromium muscovite or chrome mica and can contain mica sparkles. The color contrast makes for striking slabs, spheres and finished stones. The two components of Ruby in Fuchsite are different hardnesses. So, it is best polished with diamond. If the fuchsite doesn't provide a good enough polish, a very quick buff with green rouge (Zam) will bring up a better polish. Mohs hardness is approximately 9 for the ruby and 2.5 for the fuchsite. Sample Ruby in Fuchsite Slab. 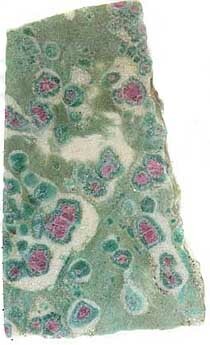 Sample of Ruby in Fuchsite Rough.